Working with the Arduino on a changing Fedora environment is a bit of a challenge. For every release or update, there’s something new and exciting which breaks the Arudino IDE, programmer, or serial connection. 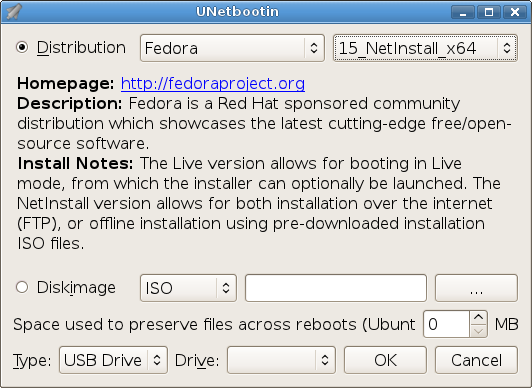 Here’s what I’ve collected for Fedora 17 and previous versions. More recently, the ModemManager (for 3G and other modems) might interfere with the serial connection. However, NetworkManager depends on the the former, so it cannot just be removed. The hack below should take care of it though (lest you want to hack around with udev exception rules). And that’s it. Now you’re all set to program the Arduino on Fedora 17. UNetbootin is one of those small, not well known, yet extremely useful tools which can save you a lot of time. In a few clicks, it let’s you create a boot image from a long list of distros, and format that right out to a USB stick. With many of the distros, you can choose between Live or Net Install images, and from versions a few years back in time. If you’ve already downloaded the ISO image for you distro, that’s OK, but it will even do that job for you if you like. The list of supported distros is impressive, from the most popular ones, to more obscure (here in random order): Ubuntu, Debian, Linux Mint, openSUSE, Arch Linux, Damn Small Linux, SliTaz, Puppy Linux, gNewSense, FreeBSD, NetBSD, Fedora, PCLinuxOS, Sabayon Linux, Gentoo, MEPIS, Zenwalk, Slax, Dreamlinux, Elive, CentOS, Mandriva, LinuxConsole, Frugalware Linux, xPUD, Foresight Linux, VectorLinux, Slackware, Smart Boot Manager (SBM), xPUD.